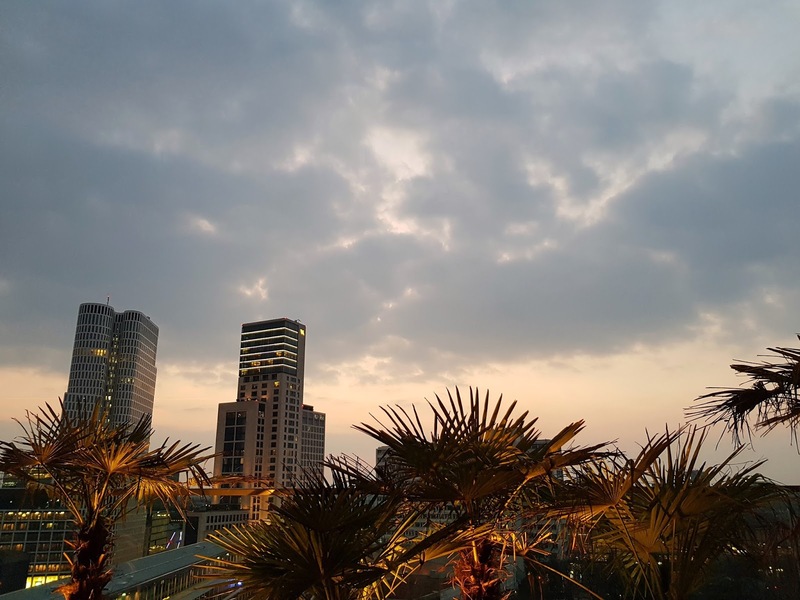 1. upon arrival we were greeted by an insane line of people vying to get into the monkey bar on the roof of the hotel, in time for sunset. as guests of the hotel, we smugly walked around the queue of tourist and to the hotel elevator. best. feeling. ever! 2. the lobby and reception area of the hotel were bladdy gorgeous. live and vibrant foliage just everywhere we looked, and floor-to-ceiling windows overlooking the zoo, meaning lots of natural light and big open spaces too. the most welcoming of receptions, for sure. 3. so much to look at! every little thing in the lounging area had been meticulously curated and so well planned to create such a calm atmosphere for the guests. we spent about twenty minutes just looking at everything in the lobby before we even made it up to our room! 4. neon lights. need i say more? who doesn't love a neon feature light in an otherwise industrial-like building? 5. hammocks. everywhere you looked, there were bladdy hammocks. 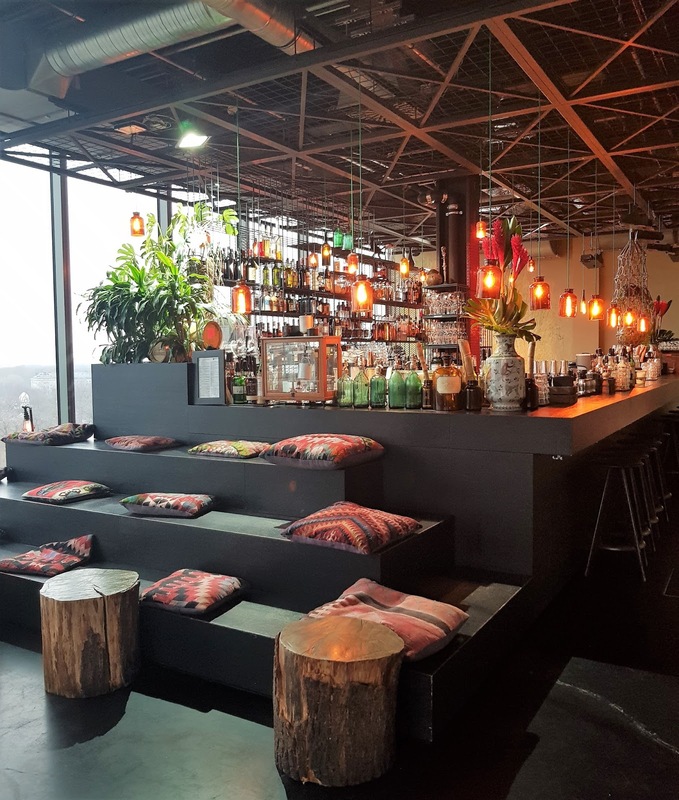 6. when we made it to monkey bar, we were blown away by the rooftop viewing platform. the gorgeous golden hour after the sun set left this stunning hue over the city, and the lights from the hotel lit up the sky. an amazing view, for sure. 7. the bar was no less beautifully curated than the lobby, and if anything, there was even more to look at up there. 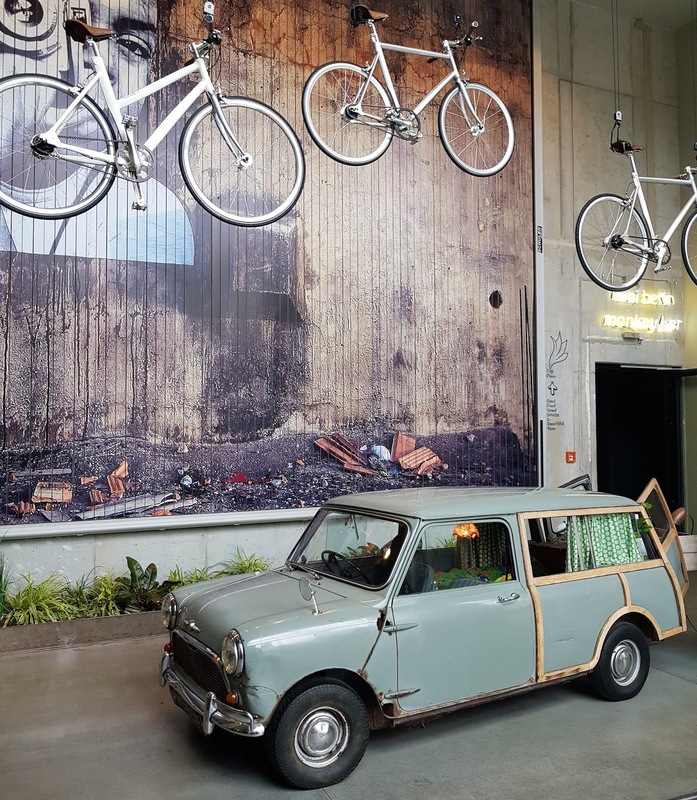 art, music, and alcohol fused together to offer a really spectacular experience for guests and visitors alike, and i can see why the monkey bar is one of west berlin's highlights. 8. cocktails. just some incredibly tasty cocktails. 9. did i mention the view? by night it was purely spectacular, but by day, we discovered a wee "viewing area" behind the bar. 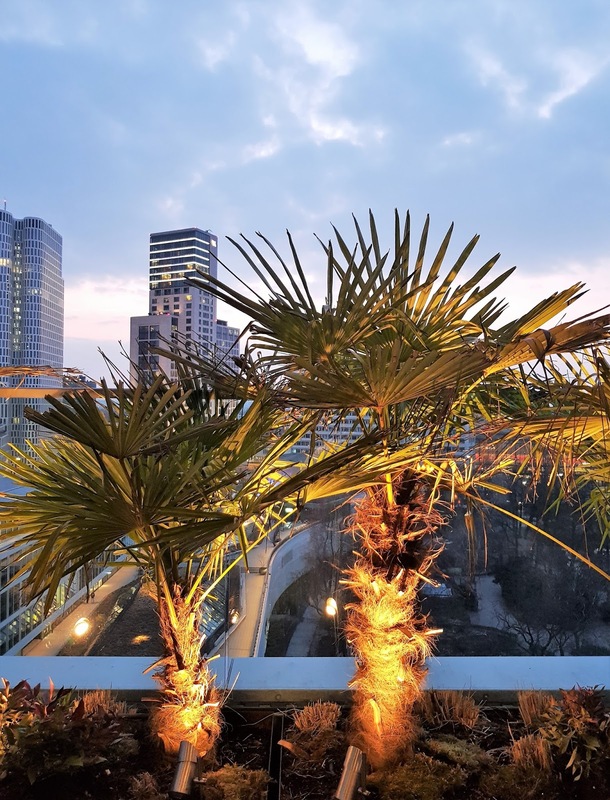 complete with cushions to sit on, and steps for easy access, the view out over the zoo allows guests to play "spot the monkey" while they sip on fruity drinks, or just enjoy the tunes from the resident dj. 10. plants. just so many plants. like, i love a plant, and this place delivered on my quest for plants, for green, and for instagram fodder. honestly, this place was just so incredibly well designed and decorated, and at every point of our stay i was blown away by the attention to detail. 11. by some trick of magic, the noise from the bar wasn't heard from our room, five floors below, at all. even with the window in the room open, the rooftop bar's late-night music was somehow trapped in the bar alone, which was grreeeat news for us, as an early night was on the cards! 12. room with a zoo; our jungle m room overlooked the monkey enclosure of the berlin zoo, and that was bladdy great. not that i condone a zoo, normally, but i figured looking at the animals from a distance sort of absolved me from any guilt.. right? 13. our room was so light and airy, with another floor-to-ceiling window as wide as the room, and it immediately was a wonderful respite from the grey and drizzly weather we'd spent the day wandering in. the walls were bright, the tiling was dark, and the sheets were crisp and white. the holy trinity. 14. the bathroom was only separated from the bedroom by a block out curtain, which was a bit weird. weird, but still bladdy cool, as the black steel against the jungle green tiles were so industrial in contrast to the vibrancy of the rest of the room. just, wholly great. 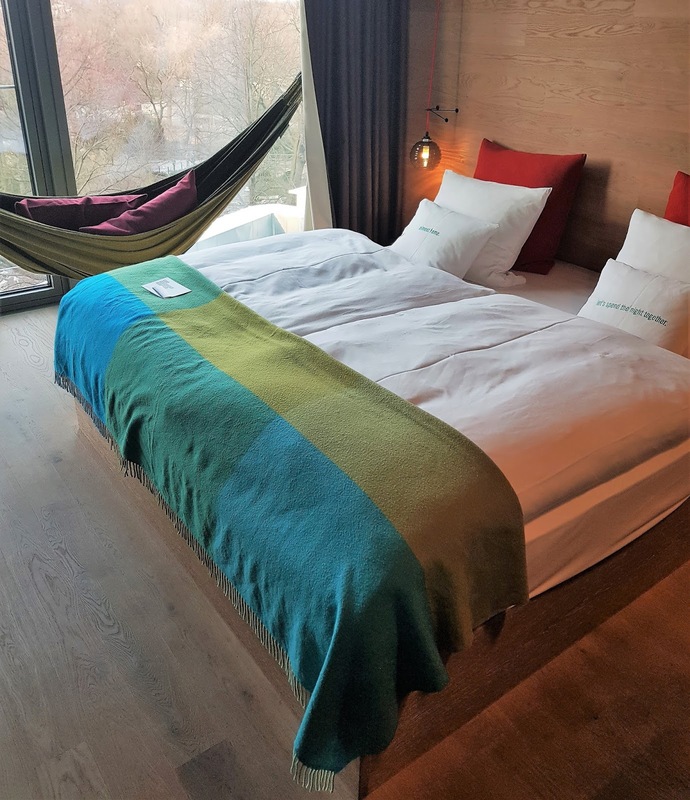 15. there was a hammock in the room. 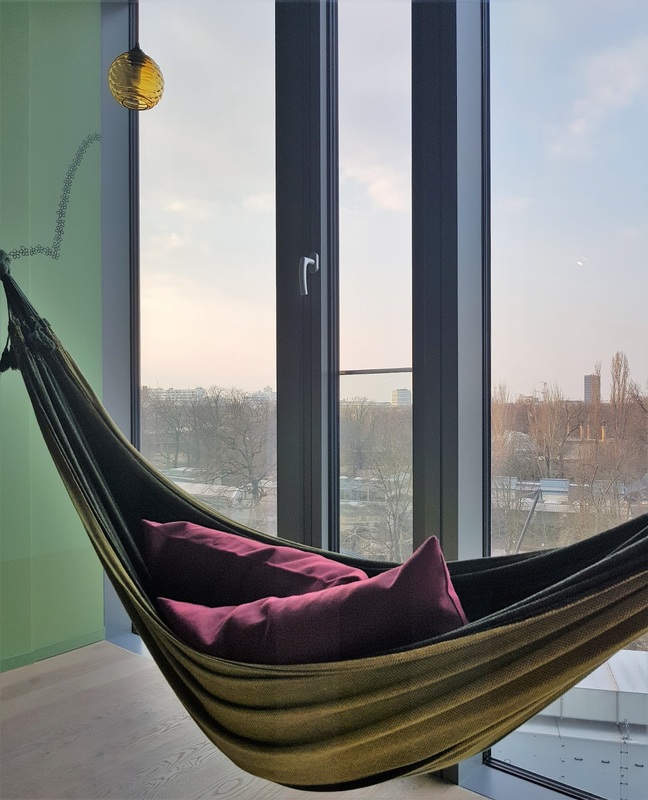 right next to the bed, by the window, held up by the walls, and it was such a soothing, relaxing joy to just swing silently while looking out over berlin. truly, just so relaxing. 16. food. free food is always great, isn't it? 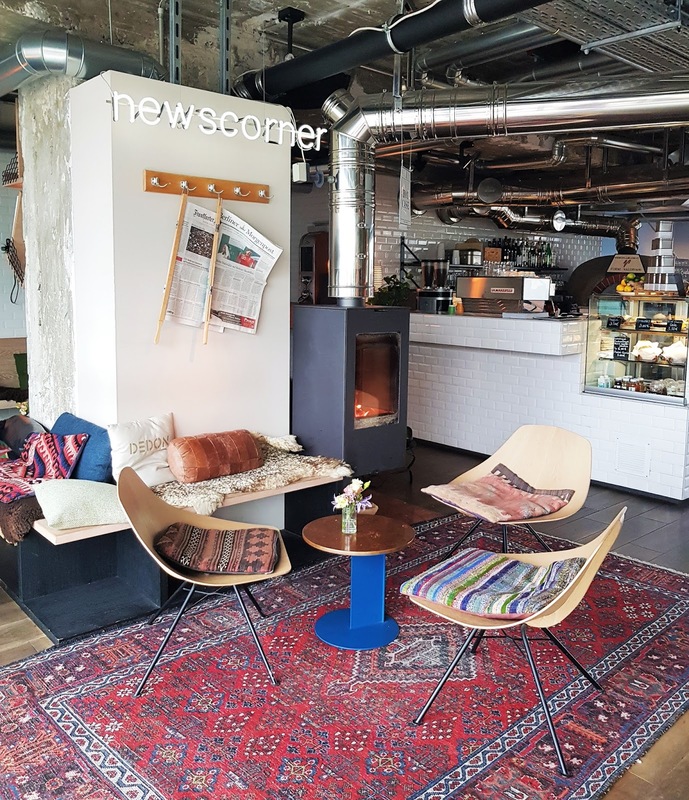 when breakfast comes with any stay, the hotel is already in my favour - especially when the options are not limited to meat eaters, or a wholly continental fare. the spread at 25hours was varied, to say the least. we had cereals from all over the world, pastries of all varieties, as well as every type of condiment you'd want. it was class. 17. coffee with a view - what a fab start to a day! we were up with the sparrows to try and get a sunrise view, but the clouds were too thick. bah! we still had monkeys being monkeys to keep us company, though. 19. the hotel offers a working space for business travelers and freelancers alike, with upright computers with privacy curtains available for guest's use, as well as incredible "break out" spaces for individuals to work in with minimal distraction. if we had stayed an extra night, i would definitely have been writing this post from the comfort of the lounge there instead of the airport floor. 20. there is personality a go-go in this place, which actually, made me feel more at home than i had the entire time we had been in berlin. for reasons i'll never understand, i was getting a lot of attention on the streets of the city - whether it be because of the colour or what, and yet here, i really felt at home. 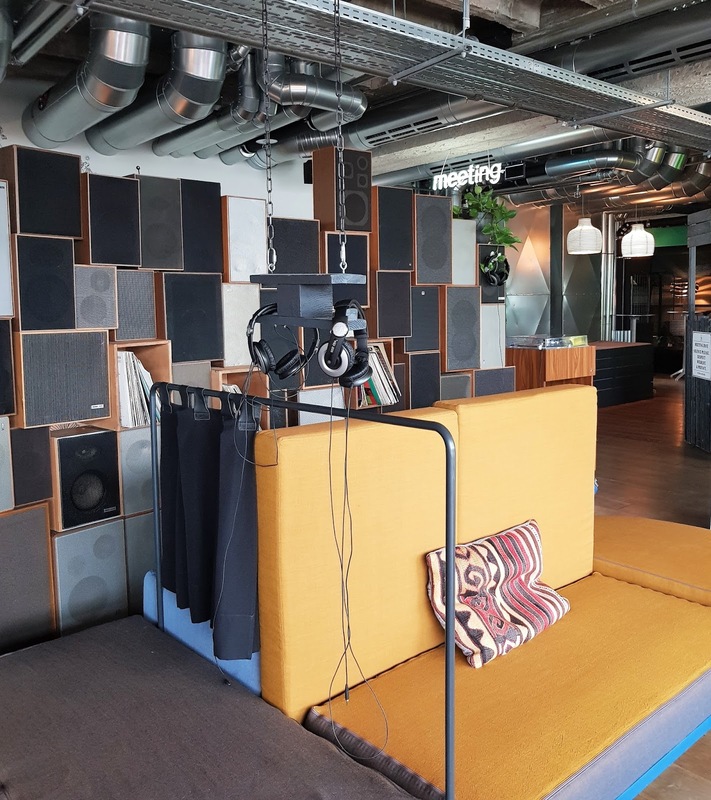 21. the fun, playful vibe of the lounge area attracts so many of the city's creatives, so it's a really nice co-working space for individuals to come together and work together on how exactly we're going to get out of the mess we have ourselves in... globally. 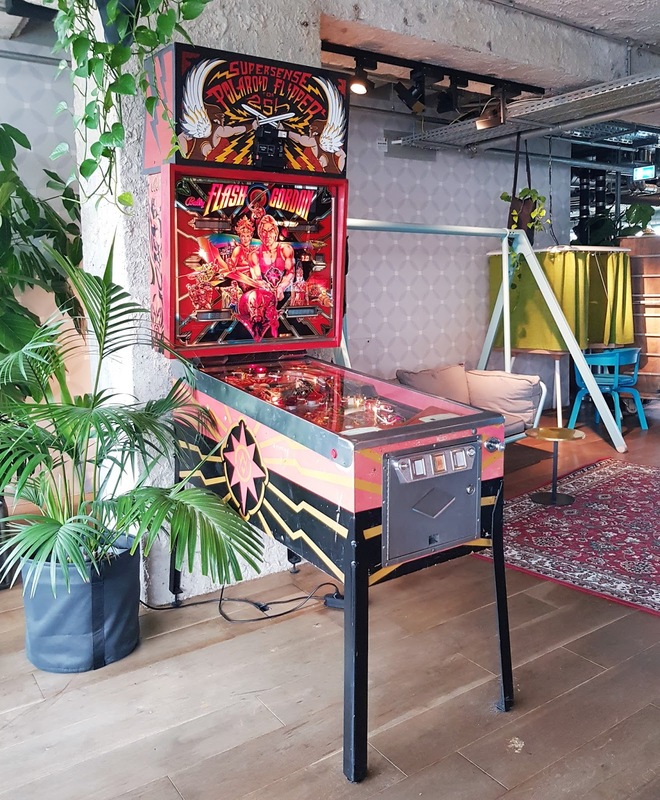 22. pinball machine and wall of speakers. need i say more? 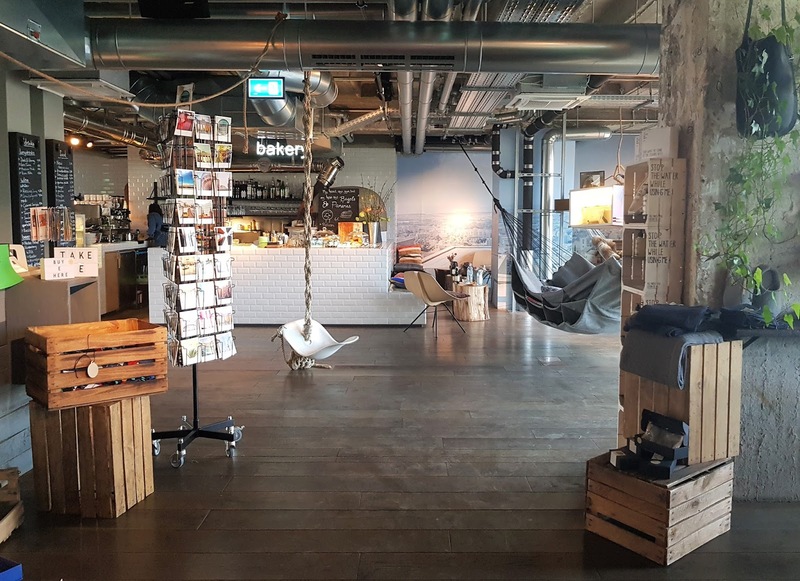 23. there's a wonderful little take-away bakery just behind the reception, where you can get everything you could possibly want or need for a day either relaxing in the lounge area, or working hard in the work spaces. gluten free and vegan options, too! 24. the elevator is insane. fair warning. 25. honestly, just the greatest hotel i've stayed in in such a long time. 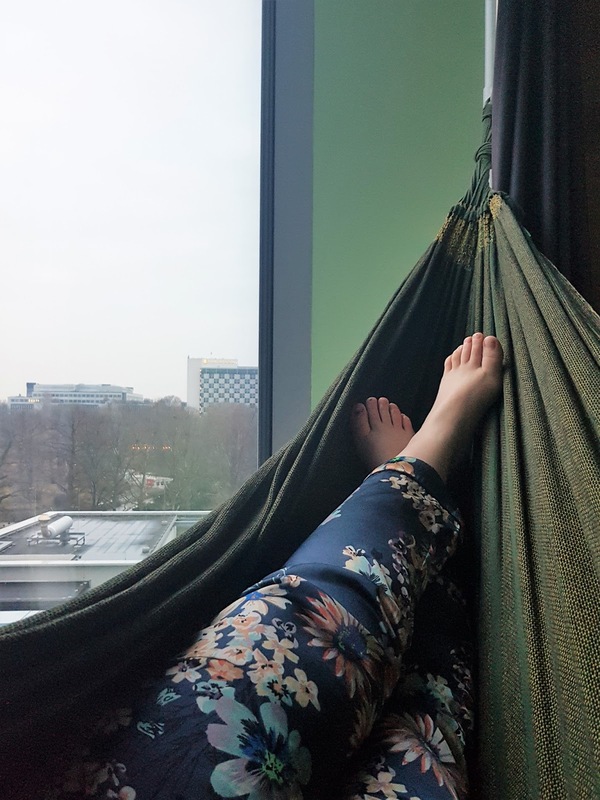 i was really grateful to be upgraded to the jungle room, and for the incredible views of berlin we were privy to, as well as the super attentive staff who were more than happy for us to take a zillionty pictures while we were checking in and out, and who were there to fulfill our every whim. so, if you're heading over to germany or vienna any time soon, definitely consider 25hours for your next stay. this was the first, but won't be the last time that i stay with them, and i'm now considering trips to each of the other properties just to see what other cool and crazy stuff they've come up with. why it's called 25hours, i'll never know, but i do know this: you will want to stay for much longer than that. *we were guests of the hotel, but all words are my own.